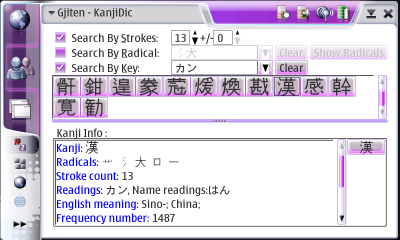 This is a port of Gjiten, the GNOME Japanese dictionary, to the Hildon Application Framework for the Nokia N800 and N810. 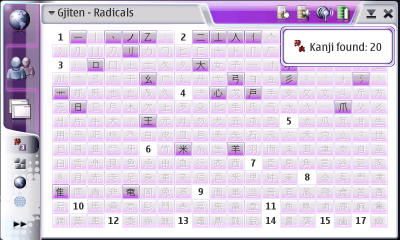 Gjiten contains word lookup in both Japanese and English with advanced features such as verb and adjective deconjugation as well as a kanji dictionary that can search on any combination of a stroke count, included radicals, or an explicit search key, including phonetic readings. 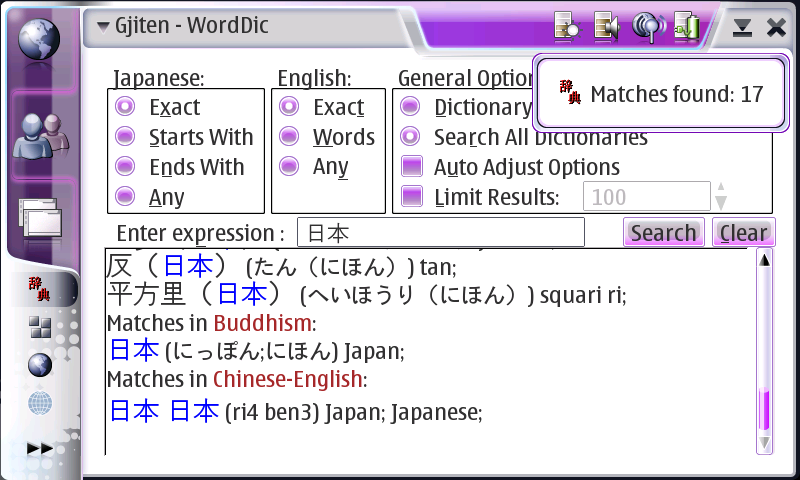 The main Gjiten application (also installs edict and kanjidic, the basic English and kanji dictionaries). Please see http://gjiten.sourceforge.net to obtain individual dictionary files and updates. 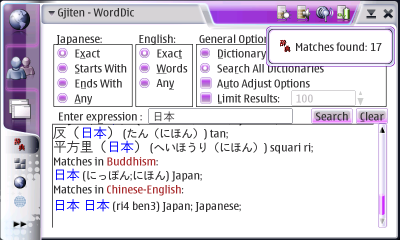 The application has been completely "Hildonized", with controls and layouts adapted to the screen size to ensure everything fits with the default font size. 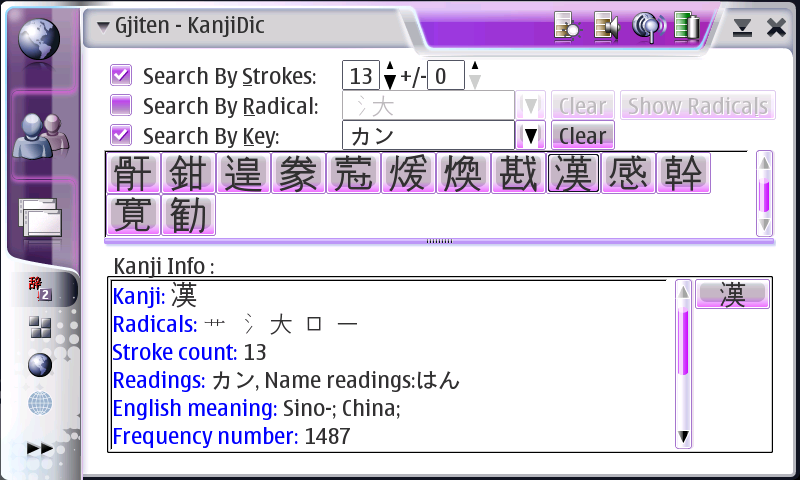 Fullscreen operation is supported, but the zoom buttons do not yet automatically adjust the font size. 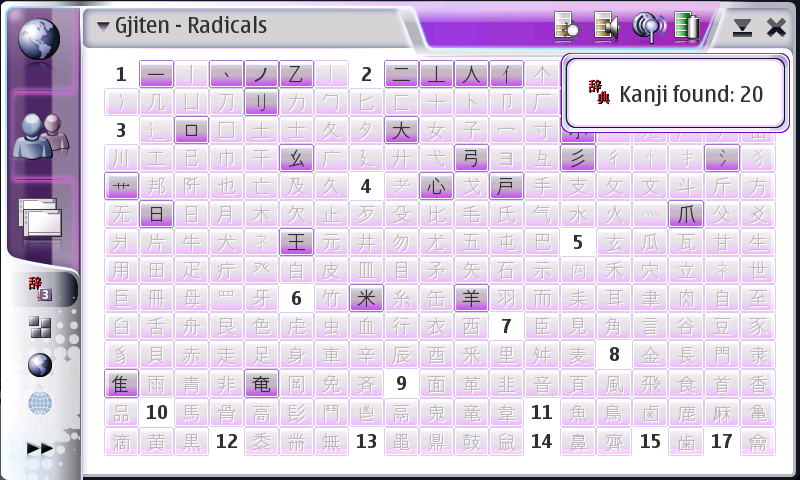 Several screenshots of the application in operation are available (click for full-sized images). Source Code, Bug Reports, etc. This project is currently hosted in the Maemo garage. Please see the project page to obtain source code, report bugs, track release, etc.